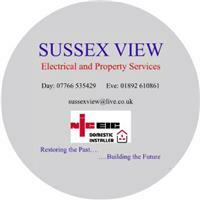 Sussex View Electrical and Property Services - Electrician based in Crowborough, East Sussex. The business was established in 1999, as an electrical and plumbing service for companies within the East Sussex area. There have been changes over the years as the business developed into a wider selection of building services. But, in more recent years the business has concentrated on its specialist electrical services to homeowners, landlords and commercial businesses. We offer a fully comprehensive selection of electrical repair, testing, maintenance and installation service to all our customers no matter how small your requirements are. In a changing world where we all require low energy products for a smarter home or business, keeping ahead with technology and being able to implement the latest ideas with you, we aim to provide a future for your family or business. It’s not an electrical emergency, but something’s wrong. You need to find out what it is and what to do about it. At Sussex View Electrical and Property Services, you’ll get a friendly response with the advice you need, plus an experienced, qualified electrician for hands-on help where it’s needed. Our services are not just restricted to the domestic and commercial electrical work, we are here to assist other trades which require an on-site electrician in a new install or that quick fix to allow you to continue with your works. We pride ourselves in offering a service that is completed as quickly as possible with the least disruption to your day and property. We cover a large area around Crowborough, usually within a 20 mile radius, but will travel further for an emergency. It’s dangerous to mess with electricity unless you really know what you are doing, so leave it to the professionals – every time.